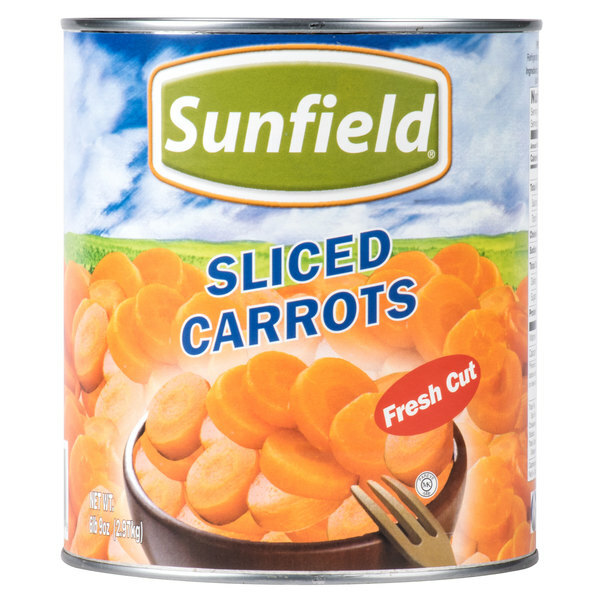 These sliced carrots bring the crisp freshness of produce straight to your customer's plate with the convenience of canned vegetables. 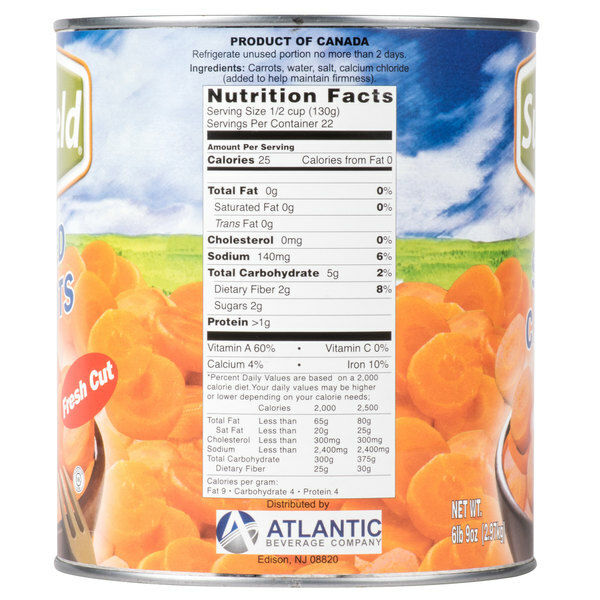 This #10 can is packed with freshly-picked carrots and preserved for optimal texture and freshness. These no-hassle carrots are already precisely, evenly sliced for cooking. Whether cooking or simply heating up, these vegetables save valuable prep time and make for a colorful, tender addition to a variety of flavorful dishes. Enhance hearty beef stews with these tender carrots, or add them to the savory juice of a seasoned roast and let your customers enjoy their deliciously fresh flavor! Offer these carrots by themselves as a classic side dish or spoon into hearty and wholesome soups. Great for adding to vegetarian dishes or vegetable medleys alongside tender meats and poultry, these vegetables also make great additions to your salad bar. 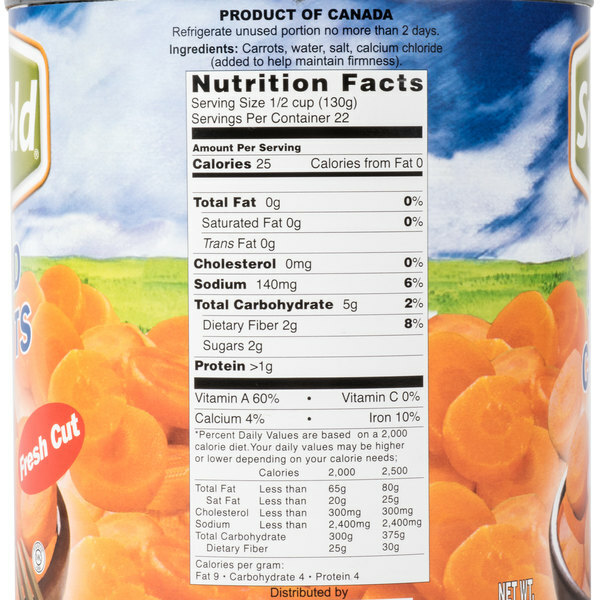 These canned carrots maintain their delicious, savory flavor while offering a comforting, homegrown taste your customers know and love! I use these carrots to make a purée for my famous carrot cake. It turns out great using this canned product. They are super flavorful and taste so fresh. The Sliced Carrots are a very tender and have a wonderful, sweet flavor. 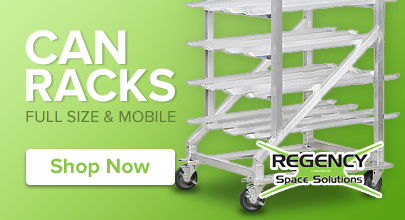 They are great for our catering buffet and make great glazed carrots medallions. Super delicious sliced carrots that are great for glazing with honey. They are tender and sweet and make a nice Japanese style carrot. A great find. These sliced carrots are excellent quality. Very tasty and flavorful. Taste fresh packed! Slices are uniform and not broken. Color is a natural orange. The price is wonderful for the size of this can! The sliced carrots are sweet and crispy. They are perfect for steaming and serving with fried rice. We steam ours and toss in a honey butter sauce for a delectable side dish. 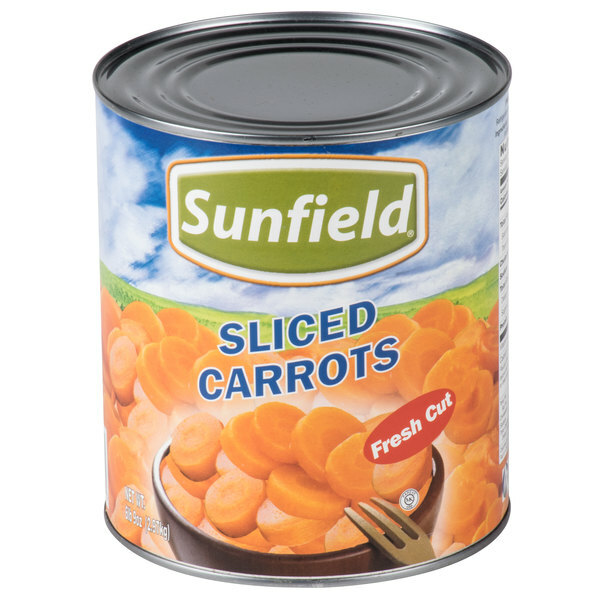 We've been pretty pleased with Sunfield Sliced Carrots - #10 Can - 6/Case. The price is right and it doesn't get much more convenient than this. These carrots taste just like they came out of a backyard garden..they are very fresh and healthy for you..great for the kids and even adults. Will be reordering. Sliced carrots are pretty much like all other sliced carrots. These are no better or worse than the regular sized cans found in local supermarkets. They though are more economical. Great carrots for homemade carrot soup. I wanted to try something new so i tried to made a batch of carrot soup. This carrot soup was simple and tasted great thanks to these sliced carrots. It was simple. I used a whole can of carrots, with the water drained, about a quart of beef broth. I also added about a tablespoon of thyme, several large cloves of garlic, a small onion and pepper. I cooked it and blended it until it was smooth. Tasted great.